Wooden beads, or sometimes referred to simply as Wood Beads, are made of wood (duh!). They can come in various shapes like round, cube, oval, spiral, barrel, rectangular and that of various flowers, animals, leaves, etc. Wood beads are also available as wood dangles. 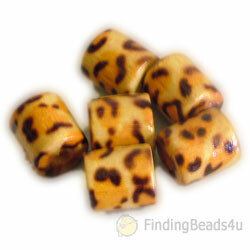 The beads have natural wood color but can be artificially colored, lacquered, painted, carved, burnt, &/or embossed. Common wood used for making wooden beads are acacia, oak, pear tree, bamboo, pine, teak, and rose wood. Because they are made from a natural product, variations in sizing, coloration, grain & texture is not uncommon and is often part of its overall attraction. Wooden beads are perhaps one of the most unobtrusively versatile beads around. They have been used for placemats, bags, bag handles, macrame work, jewellery, curtains, apparel emblishments, etc.